When fishing the Highland Lakes, anglers tend to favor motorboats and largemouth and striped bass. All for good reasons. A motor gets them up and down the lakes, and the two bass species are great sporting fish. But there are other ways to hook the big one (and it doesn’t have to be a bass). 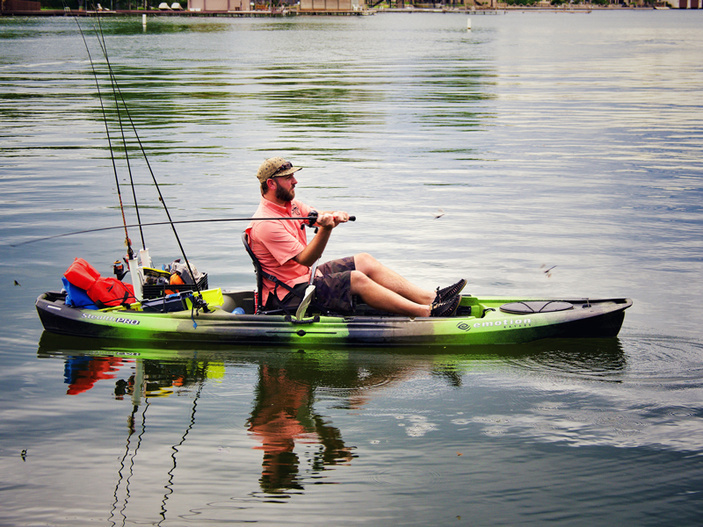 Let’s talk kayaks, fly fishing, and the rainbow trout. First, consider a kayak. These small, but nimble watercraft have been around for hundreds of years, and they’ve proven their worth. Kayaks get you out on the water and exploring. Even larger bodies of water such as lakes Buchanan and LBJ are fine for kayaks, but always have a life jacket and emergency equipment on board. The beauty of the kayak is it is light enough to toss on a car rack, in the back of a pickup, or on a small trailer — and off you go. For a nice place to drop in your kayak, consider the Cottonwood Shores boat ramp, 3729 Lakeview Drive, which puts you in the upper part of Lake Marble Falls. The rocks and structures in the area are good habitat for a number of fish. Another spot is the Lower Colorado River Authority’s Camp Creek Park, which gives you access to the upper part of Lake Travis. This section of the lake fluctuates quite a bit due to rainfall and lake levels, sometimes making a kayak or similar craft the best, and only option, for exploring and fishing. “Well, that sounds great, but I don’t have a kayak,” you might say. No problem. You can rent one. Inks Lake State Park has kayaks and canoes and holds occasional kayaking classes. You can also rent a kayak at Blanco State Park. To the north, you can fish upper Lake Buchanan with a rented kayak from Canyon of the Eagles. The Lower Colorado River Authority rents kayaks at two of its Highland Lakes parks: Black Rock Park on Lake Buchanan and Muleshoe Bend Recreation Area on Lake Travis. Plus, there are several local businesses that offer kayak rentals (check the listings to the right). If you’d rather wade in on your own two feet, there’s always fly fishing. One of the most popular fly fishing spots in the area is the Llano River. With several access points, anglers can cast for rainbow trout as well as Guadalupe bass, which are found only in certain parts of Texas. But you can also fly fish along lake shorelines. As temperatures cool in the fall, bass and other gamefish move closer to the shallows, making it easier for fly anglers to attract them with Muddler minnows, Woolly Buggers, and terrestrial-style flies or a sinking line with a fly dropped down a few feet. The point is: Fly fishing isn’t just for rivers and streams. You can even combine fly fishing and kayaking, giving you better access to those haunts along lakeshores. Fly anglers often have trout on the mind. While not a native fish species, the rainbow trout is a favorite of winter anglers in the Highland Lakes. For several years, the Texas Parks and Wildlife Department has stocked rainbow trout in waters across the state during the winter for fishing. 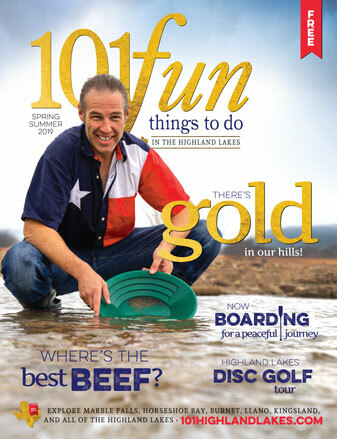 The department releases several thousand rainbows — of catchable and eatable size — in the Highland Lakes. They usually begin releasing the trout in December with subsequent releases through February, depending on the location. One of the best spots to find the trout, once released, is in the Llano River from Castell down toward Llano proper. The TPWD releases the trout at two to three locations in the river, usually with Castell being the farthest west. Other locations are W.M. Brook Park in Lampasas and Blanco State Park in Blanco. You do need a regular fishing license with a trout stamp when fishing for rainbow trout. Since the fish won’t survive once the temperatures start climbing, you’re encouraged to take those you catch. So don’t let the cooler, and sometimes downright cold, weather keep you off the lakes and rivers. The fall and winter are prime times for fishing — even without a motor. Be sure to share your fishing photos with us at #101HighlandLakes. • Canyon of the Eagles resort, 16942 RR 2341 on northern Lake Buchanan — You can rent a kayak from the resort’s store and explore the northern reaches of Lake Buchanan. Rentals are available Friday-Sunday. Call (512) 334-2070 to reserve a kayak. Go to canyonoftheeagles.com for more information. • Castell General Store, 19522 RR 152 West in Castell — Rents kayaks on the Llano River. Call (325) 247-4100 or go to castellgeneralstore.com. • Inks Lake State Park, 3630 Park Road 4 West in Burnet — Along with canoe, kayak, and paddleboat rentals, the staff routinely holds canoe and kayak programs so you can learn the ins and outs of paddling. Call (512) 793-2223. • Jolly Rodgers Paddle Co., 120 Main St. in Marble Falls — Rents standup paddleboards on Lake Marble Falls. It also offers single kayaks and paddleboats. Go to jollyrodgerstx.com or call (830) 385-3819. • Just Yakin' Kayaks — Offers rentals in the Highland Lakes. Go to justyakin.com or call (325) 665-1208 or (325) 668-2536. • Llano General Store, 303 Bessemer Ave. in Llano — Rents kayaks and canoes and offers shuttle services along the Llano River. It covers the Llano River from Castell to the Kingsland Slab. Go to llanogeneralstore.com or call (830) 998-8031. • LCRA parks — Two LCRA parks offer kayak and paddleboard rentals: Black Rock Park, 3400 Texas 261 in Buchanan Dam, and Muleshoe Bend Recreation Area, 2820 CR 414 in Spicewood. Go to lcra.org.